At the Region is an ongoing feature that discusses the state-by-state training, certification and employment requirements of first responder departments across the nation. This section looks at the history and development of first responder standards, and spotlights the way that small departments integrate local specialties into national regulations. 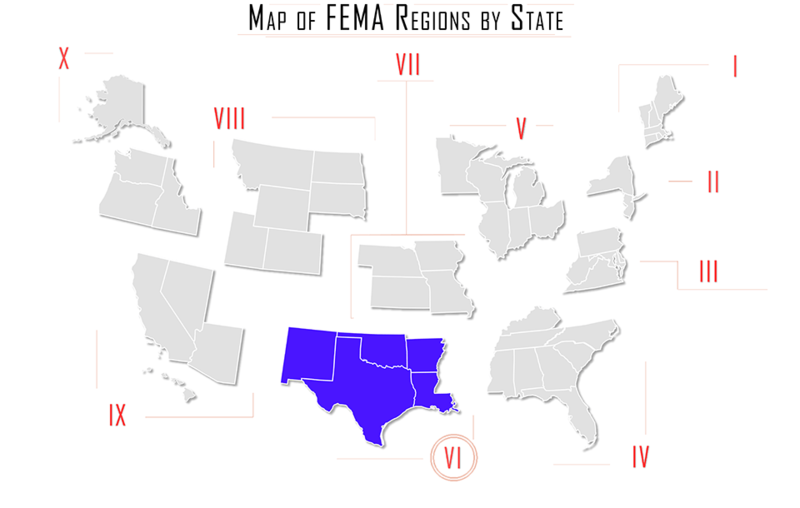 In this issue, At the Region looks at requirements in Region VI, including Arkansas, Louisiana, New Mexico, Oklahoma, and Texas. ACT 833 provides funding for training and equipment to ensure all fire departments in the state maintain a level of training. The ACT 833 funding is available to assist departments with a minimum of six (6) active firefighters that meet the training requirements (ACT 808 from 2009) qualify for annual funding. All new volunteers are required to take three initial classes within the first year. Other training requirements may be identified by each department with specific timelines. Check with the department where you will be volunteering. The Arkansas Fire Training Academy offers On-site and Off-site training courses throughout the state. For the most recent schedule information, visit here. For more information, visit the FAQ page within the Arkansas Organization of Fire Chiefs. Title 33 Chapter 4 of the Louisiana revised Statutes provides the governing law surrounding fire departments, personnel, benefits, and operations. Part II defines the Fire related laws, which can be downloaded as a PDF. An Entrance Exam is required for any firefighter seeking a full-time paid position. This exam is given throughout the state, and the qualifications and residency requirement may differ between agencies, provided every department or parish required to follow the minimums as set forth in Title 33 is met. • Unless otherwise specified, all requirements must be met before admission to examination. • Must meet all requirements of the Municipal Fire and Police Civil Service Law, including being a citizen of the United States and of legal age. • After offer of employment, but before beginning work in this class, must pass a physical examination, the selection and administration of which shall be authorized by the Appointing Authority, designed to demonstrate good health and physical fitness sufficient to perform the essential duties of the position, with or without accommodation. • Applicant must possess one of the following: high school diploma, general educational development (G.E.D.) certificate, high school transcript, affidavit from the issuing high school, associate’s or bachelor’s degree, or college transcript, any one of which must indicate that graduation has occurred or a degree awarded. A certification of completion shall not be sufficient to substitute for a diploma or G.E.D. certificate. • Must possess a valid driver’s license. • Must not be less than eighteen (18) years of age before offer of employment. • Prior to confirmation in this class, must establish and maintain residency within a fifty (50) mile radius (air miles) of the City of Gonzales limits at all times while employed by the City of Gonzales Fire Department. The New Mexico Legislature in Title 10 Chapter 25 provides the guidelines for certification of Fire Departments, and the grant money available for personnel training and agency equipment procurement. (1) NMFTA shall publish or adopt all performance evaluations required under this rule in the form of position task books (PTBs). The NMFTA shall use NFPA standards, other national standards, or nationally accepted training curriculum as the basis for PTBs. The NMFTA shall develop and offer performance-based courses that fulfill the requirements of a PTB. (c) successful completion of the written and manipulative examination(s) for a given course(i.e., challenge the course). (3) Certification by NMFTA is not mandatory. The intent of NMFTA certification is to provide assurance to local government that a fire department member has been evaluated and has demonstrated the knowledge and skills necessary to function in the position identified in a given PTB. **A trainee should be determined to be competent, by local government, at all tasks required by local government within two years of entering trainee status (i.e., assigned a PTB)). Qualifications for applicants for the Albuquerque Fire Department can be found here. • Possess a current, valid, and permanent State or National Registry Emergency Medical Technician EMT license at the basic level or higher by the close of open enrollment. • Applicants selected as cadets will be required to complete the reciprocity process and acquire a State of NM EMT license during the cadet program. • To enroll in a EMT Basic Course applicants may contact any New Mexico College or University, such as Central New Mexico Community College or the University of New Mexico's EMS Academy at (505) 272-5757. For reciprocity consideration, a reciprocity application, the applicable fee, and supporting documentation for prerequisite satisfaction must be submitted for review. The applicant will be notified in writing of the decision. 1. Applicant is a current resident of New Mexico and/or a member in good standing of a New Mexico Fire Department. 2. A copy of the certificate with an IFSAC seal and authenticating number verifies current certification. The seal and number must be readable and intact. 3. Applicant must submit documentation verifying completion of any prerequisites required by the New Mexico Firefighters Training Academy for the occupational level in which reciprocity is sought. 4. The occupational level of the applicant’s current certification must also be accredited in New Mexico by IFSAC. Any candidate who has previously failed either a written or skills New Mexico certification exam shall not be eligible for reciprocity for that occupational level. Reciprocity will only be granted for the NFPA edition of the original certificate. Reciprocity will only be considered for the last two revision cycles. 1. Proof of equivalent training must be supplied. 2. Training must meet NFPA requirements of level sought. 3. Request may require curriculum outlines and course objective for documentation. 4. Certificates must be authenticated by the issuing agency. NOTE: Some cities and towns require that you have your High School Diploma or your GED. Oklahoma has a link to a guide for the Families of Volunteer Firefighters. Paid Firefighter requirements vary by agency/department. The requirements for an entry level Oklahoma City Firefighter may be found here. • To enforce statewide fire service standards. Many of the state's VFDs are members of the State Firefighters' and Fire Marshals' Association (SFFMA). The SFFMA is a trade association of VFDs and "combination" departments. The SFFMA offers a certification program for its member departments. The SFFMA certification is not the same as the State of Texas certification, but if you earn the SFFMA advanced (or "Firefighter II") certification, you may qualify to take the state test. 1. Finish a basic fire fighter training program. 2. Show that you can perform basic fire fighting skills. 3. Pass the state certification test. 4. Finish your emergency medical responder training. 5. Get fingerprints and pass a criminal history background check. 6. Apply for your certification. Reciprocity is available from other jurisdictions, if the jurisdiction you transfer from is “IFSAC” is the International Fire Service Accreditation Congress (IFSAC). Certifications transfer, subject to a review and the currency of certification. Transferring to Texas from an IFSAC jurisdiction The State of Texas recognizes IFSAC certificates from other jurisdictions in its basic structural fire protection, aircraft crash and rescue, hazardous materials technician, driver/operator-pumper, fire inspector, fire investigator, fire instructor and fire officer disciplines. • A copy of your Fire Fighter II IFSAC seal. • Documentation of completed equivalent medical training (ECA, EMT or Paramedic) or certification (Texas Department of State Health Services or National Registry). A copy of your certificate of completion from the training or your actual certification card would be acceptable documentation. • A completed Form TCFP-002, Application for Certification (including completion of the fingerprint criminal history check, when applicable). • An $85 certification fee. 1. Find out if your training is equivalent to Texas requirements. 2. Complete the commission-designated skill evaluation process. 3. Pass the commission examination in the discipline for which you are seeking certification. 4. Determine whether you meet any additional certification requirements. The requirements for becoming certified for each certification discipline the commission offers are in the Standards Manual for Fire Protection Personnel. The following information presents the basic certification requirements in a step-by-step format; it is for explanation purposes only and does not supersede the rule.